You are at:Home»Eye Donation»Are you ready for Eye Donation? Are you ready for Eye Donation? Over fifty lakh people can see colours of this wonderful world only with your help ! Don’t be surprised there are over 60 lakh people in this country who are living life of darkness due to damaged cornea. May be among the millions of people living in the country, the figures of fifty lakh is just mere, but one thing is for sure that these fifty lakh people who are living their life in dark are not just the one who are suffering but are affecting the whole family and society. The members of the family are affected both physically and financially and the most important fact that the blind person gets nought and is unable to give his/her contribution to the society. However in this today’s era there are several gadgets available which help these blind people live a normal life and contribute towards the society. But the number of such people is very negligible. Even today the blind is treated as a subject of pity and their presence among the society means nothing. In most of our houses the person who is blind is not allowed to go out of the house, and if that person is a girl, then is more than impossible that she could get out of the house. The schemes and facilities of the government is not reaching to these people, there is shortage of eye-specialists and in such conditions it becomes important that our society get awakened with the fact that they should not only protect their own eyes but could also help these blind people to move ahead shoulder to shoulder with the society. The world is great and beautiful and the environment spreads colours of happiness in one’s life. 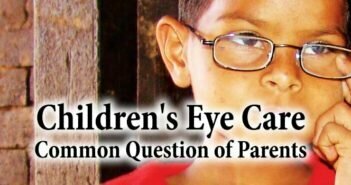 In our world in every five second one person gets blind, where as 89 percent of blind children suffer blindness before attaining age of 5. 90 percent of children doesn’t go to school. Learning the importance of eyes is the only way that we can protect them. Have you ever imagined that if how would the life be without eyes and to learn what could happened without eyes, just blind-fold your eyes for a period of 2 minutes and try to do something. You won’t believe what has happened to you and what the hell the life has become in just two minutes. There are large number of people in our country whose life is something like our imagination without eyes means just “HELL”. These blind people who are nearly fifty lakh in number can get colours of life if they get cornea donor. The need is to propagate more and more about the importance of eye donation. 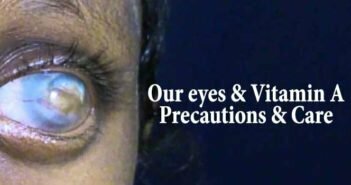 Only meagre efforts and awareness between us can help these people get the eye-sight back. Seeing the seriousness of this eye – donation a fortnight is being celebrated between Aug 25 to Sep 08 2014. You can also join the mission by taking an oath to donate your cornea. This one little step can really mean a lot for someone. There are eye banks in every state of the country. There is false myth among the people of the country that after the death, the whole eye of the person is taken out of the body, in name of eye donation. Whereas the fact is the doctors take out only the cornea of the deceased person. The cornea of the deceased person should be taken out within six hours of his/her death. Thus, hurry up in making a call to the eye bank. By the time the doctor’s arrive the eyes of the deceased person should be kept protected by keeping wet cotton over the eyes. Soon after receiving the message the doctors and technical staff arrive at the spot and take sample of blood and cornea from the deceased person. Eye donation doesn’t make the face obscured and the entire process is done free of cost. Soon after the cornea reaches the eye bank it is tested and soon after the tests this is sent to the special surgeon so that it could be implanted to a blind person. With the help of one eye donation, means both eyes of the deceased person, two blind person can get their eye sight back. During the process of eye implantation, cornea or the white part around the cornea is implanted. Even you can be one of those who can bring colours in life of a blind person. In case of the death at your house please take care that the eyes of the deceased person is donated to bring eye sight for someone who is blind. There is no caste discretion in the process of eye donation and there is no age limit also. 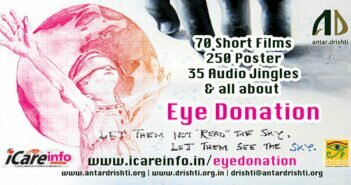 The importance of eye donation should be explained to our family members also, and also to the near and dear ones, so that an awakening could start up.